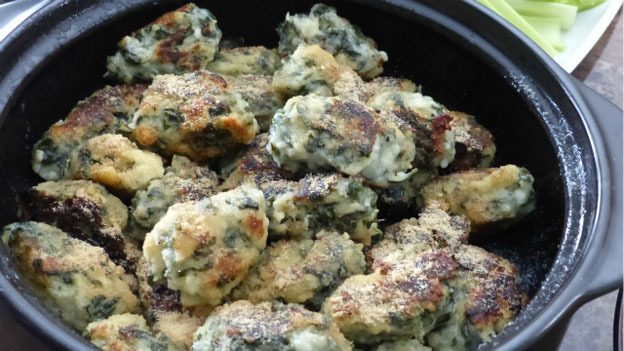 Gnudi is a fantastic dish that tastes incredible. Finely chop the lamb’s quarters. Combine with the cottage cheese, egg, 3/4 cup of flour, sea salt and 1/4 cup of parmesan cheese. Mix well and form into dough. Knead and add rest of flour until it becomes a workable consistency. Don’t overwork. Let sit 30 minutes. Break off small clumps of dough, roll in flour, and form into dumplings (about 2 “ long and 1” wide). Boil water in a pot; add some salt and a few drops of oil. Once boiling, place the gnudi into water and let boil for about 7 minutes. Do not crowd the gnudi. Drain. Place in a fry pan with butter and brown. Sprinkle with the remainder of the parmesan cheese and spice mixture.